At a pivotal time for the oil and gas industry, wireless sensor networks (WSN) are connecting stranded assets, streamlining operations and reducing deployment costs, according to a recently published report by global IoT research firm ON World. ON World’s Q2 2018 survey of 159 industrial automation professionals found that 43% are targeting oil and gas applications. Two in five of the oil and gas respondents have installed over 1,000 WSN nodes across all locations. Twenty percent (20%) have deployed networks with at least 3,000 nodes compared with 6% in our previous survey in Q4 2016. The fastest growing oil and gas WSN applications are asset tracking and locating, process control, environmental/safety and asset/machine health monitoring. Applications for wireless mesh sensor networks continues to grow, illustrated by ABB’s WirelessHART equipment monitoring network deployed on the Goliat floating production storage and offloading vessel (FPSO) in the Barents Sea near Norway. 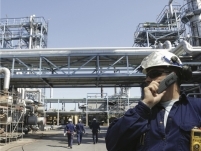 ON World’s survey found that over half of the oil and gas respondents are using WirelessHART and/or ISA100 Wireless. However, adoption of Bluetooth, WiFi and Low Power Wide Area (LPWA) technologies such as LoRaWANTM, NB-IoT, LTE-M and Sigfox has increased faster.